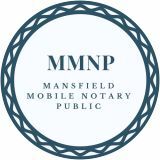 Mansfield Mobile Public Notaries (MMPN) is at your service to accommodate your schedule any time and anywhere. Give us a call to receive fast quality confidential service. We promise to handle your needs professionally and accommodate you in the most efficient manner. MMPN is located in Mansfield, Texas and provides notarial and certified signing services for private citizens and local businesses in the Arlington, Cedar Hill, Desoto, Grand Prairie, Mansfield, Tarrant County and the surrounding areas. To schedule your signing appointment email or call us.